Collaboration is at our core. War Child wouldn’t exist without its friends. Raising money can be incredibly fun. Most importantly, it helps us to support more children affected by war. Whether that’s rocking a band tee with your work mates, leaving a legacy, or running a marathon, your passion and energy means we can reach more children and have an even greater impact. For corporate partnerships, it means sustainable funding, expertise and exposure to new audiences. Combined, this enables planning for the future and reaching more children whose lives have been torn apart by war. This November, War Child is staging its inaugural ARIA Week show, giving you the chance to see one of the biggest names in music performing in an intimate venue. 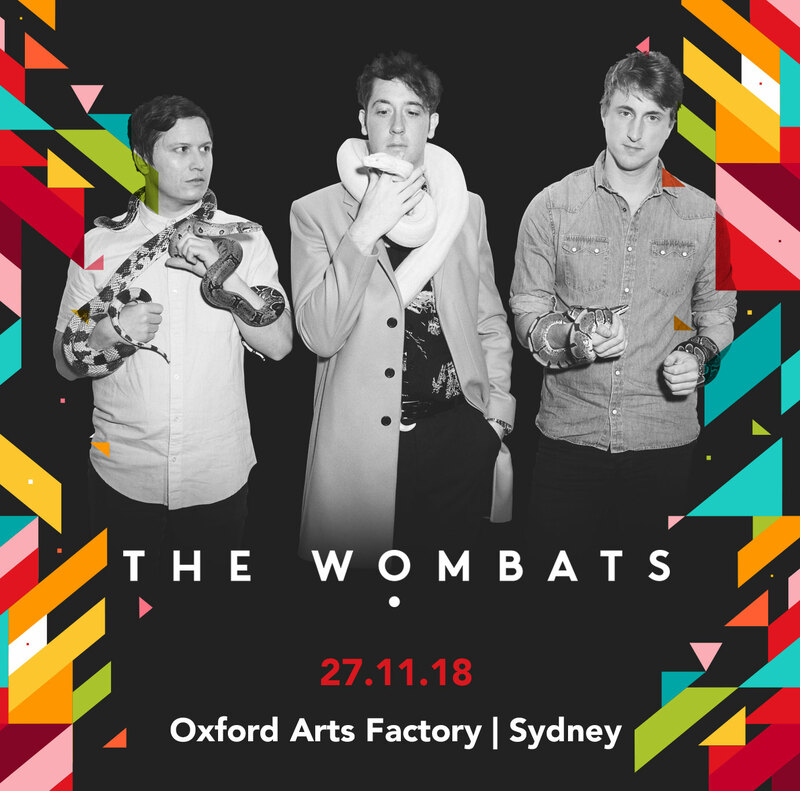 This very special intimate show will see The Wombats play their smallest Australia gig to date all for an amazing cause. This is not one to miss! Get tickets and enter the prize draw here! You can enter a prize draw by making a $10 donation to be in with a chance of winning 2 tickets to see The Wombats. The prize draw for entry opens at 9:00am (AEST) on Wednesday, October 31 and closes 5.00pm Sunday 18 November 2018. To maximise your chance of winning, you can enter as many times as you like. War Child Presents is a partnership between War Child Australia, ARIA Week, Comes with Fries, Warner Music, and Secret Sound. Profits from the prize draw and ticket sales will fund War Child’s mission to support and improve the protection and care of children and young people who live with a combination of insecurity, poverty, and exclusion in some of the worst conflict-affected places. It’s time to put away your suit or uniform and dig out that moth-eaten Nirvana t-shirt. All in the name of charity. It’s the day your boss or teacher will let you wear your favourite band t-shirt to work. What will your boss wear – Run DMC or AC/DC? You wear your favourite band t-shirt to work or school and give a donation to War Child Australia. Take photos of you and your colleagues in your Cold Chisel/Madonna t-shirts and we will share them with our Facebook and Twitter followers. Use the hashtag #wearitforwarchild to grab our attention! After you’ve provided for your loved ones, would you consider leaving a gift for War Child in your will? Our vision is a world where children’s lives are no longer torn apart by war. Our work won’t stop until every community, every family, every child is protected from the devastating effects of violent conflict. It’s not a quick-fix solution—that’s why gifts in wills are so crucial to our work, and so valued. Gifts in wills help make sure that our life-changing work will continue making a difference for generations to come, so more children can have a safer, happier, brighter future. We understand and respect that your decisions about your will are private, personal and made after long, careful consideration. But if a leaving a gift in your will to War Child is something you might be interested in, we’d be more than happy to discuss it with you. War can flair up quickly. The trauma that children are exposed to in the short term can take a lifetime to recover from. Much of the negative impact on children can be prevented if protection systems are developed quickly enough. Responding rapidly is vital. Since 2016, violent clashes and inter-communal tensions fuelled by armed groups have continuously increased. War Child’s work in CAR focuses on child protection, advocacy, and demobilisation and reintegration of children associated with armed groups. A donation from War Child Australia went towards this forgotten crisis supporting War Child’s vital work in one of the world’s poorest country. As ISIS has been widely defeated in Iraq, it is easy to believe that normality will quickly resume for Iraqi children. Yet children continue to suffer the consequences of war as their homes have been destroyed, their education interrupted, and they have witnessed executions and violence. War Child continues to support children’s education and offer psychosocial support in 2018. A donation from War Child Australia went towards our programmes in Iraq that support children to recover from years of being exposed to conflict and violence.